Sue and I had occasion to be in Williamson WV on Saturday afternoon, and I spent an hour or so at the flood gate while she did some shopping. I heard w/b 17M announce his arrival passing the signal at Sycamore Cut. 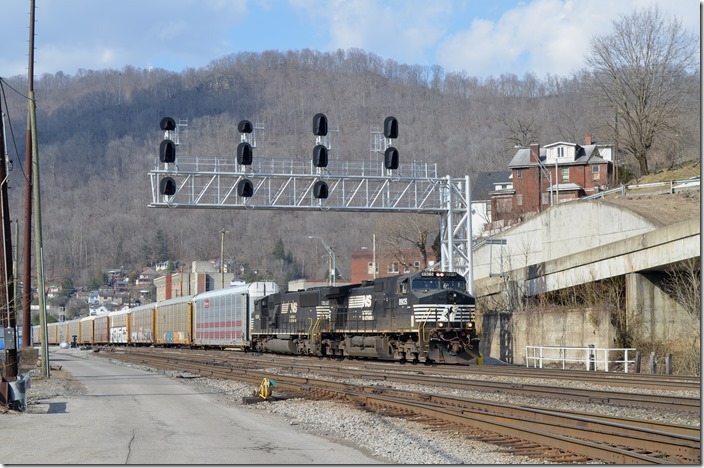 The yardmaster informed him that the outbound crew was coming on duty in about 15 minutes. 1. 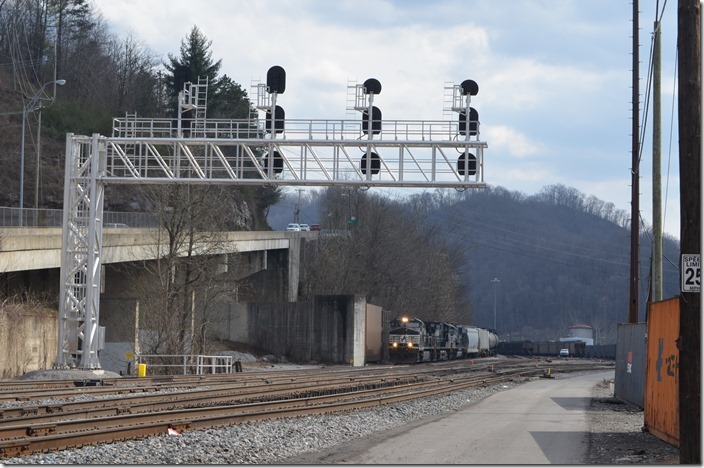 All of the signals at the west end of Williamson Yard were recently replaced. Instead of pulling down by the old depot (now city hall) where the signals used to be, 17M stopped at the flood wall gate where there is a concrete pad across the tracks to walk on. NS 8974-9003-6963. Williamson WV. 2. 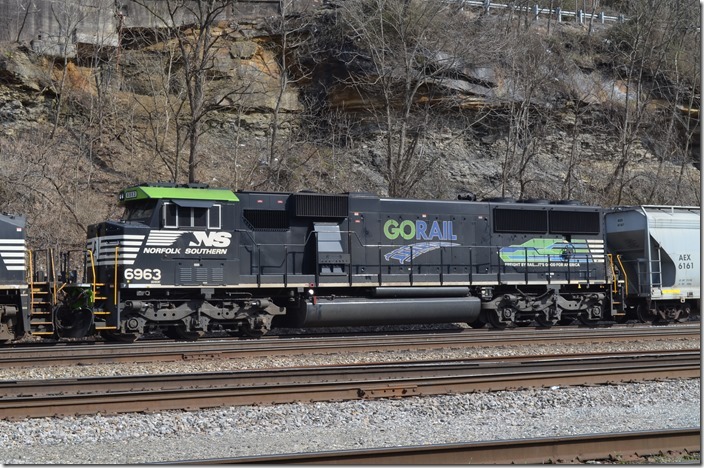 Rebuilt NS “SD60E” 6963 (a former SD60 with a NS-designed cab) was a real eye-catcher! NS SD60E 6963. Williamson WV. 3. NS SD60E 6963. 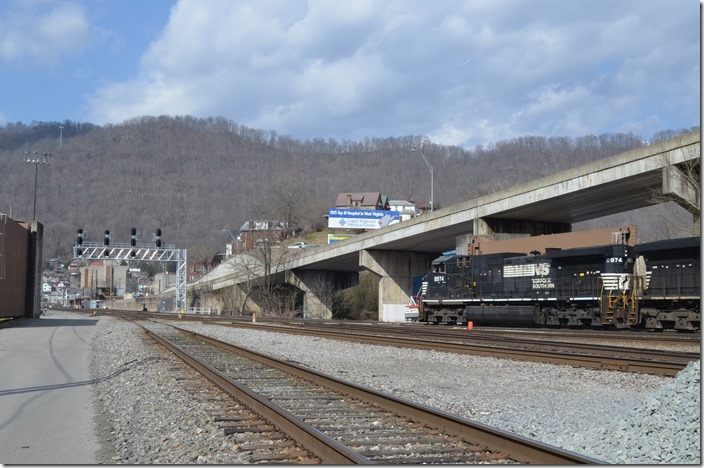 Williamson WV. View 2. 4. D9-C44-9W 9003. Williamson WV. 5. The new signals at the west end cover all outlets in one location. NS 8974. Williamson WV. 6. NS 8974-9003-6963. Williamson WV. 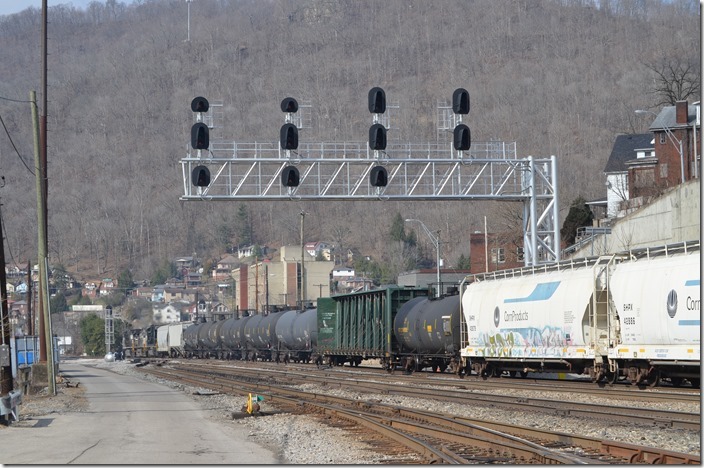 17M-19 (Linwood, NC to Elkhart, IN) departs for Portsmouth OH, with 22 loads and 140 mtys. This was one big train! 7. Two mast signals control the approach to the yard eastbound off double track. NS 8974-9003-6963. 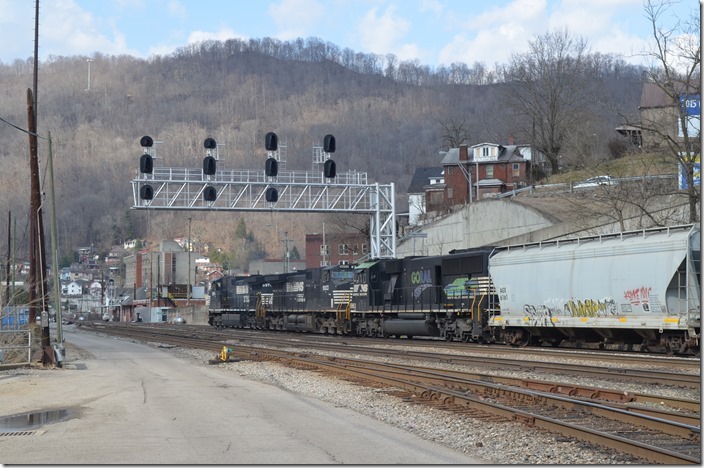 Williamson WV. View 2. 8. 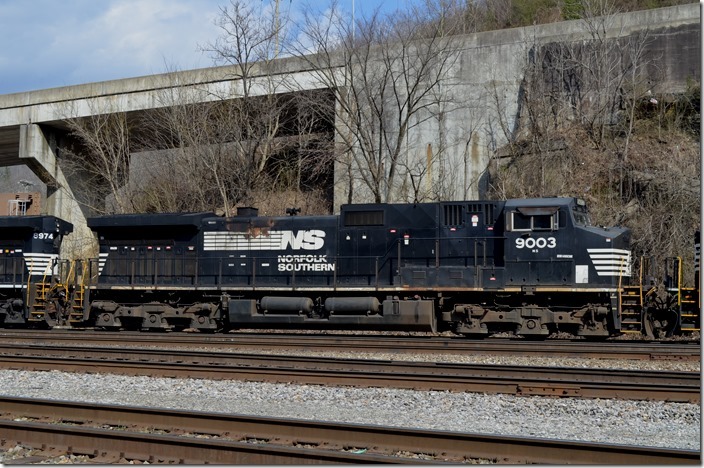 NS 8905-6808 Williamson. 272 announced its approach when passing Borderland. 8905-6808 roll through Williamson with an anticipated stop at Sycamore Cut for a crew change. No. 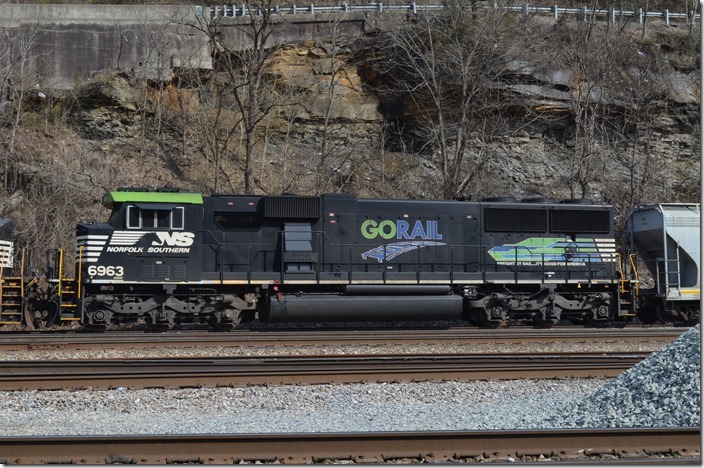 272-18 (Kansas City to Walkertown, NC) has 66 loads of new autos. 42 are destined for Walkertown (Winston-Salem) with Hondas, Fords, Chryslers and GMs. 24 will go to Petersburg. 272 had a beautiful new BNSF multi-level, but I missed getting the shot. It was orange instead of the basic yellow.